Mango Chutney is a very versatile condiment, typically served as a side dish with many curries. Not forgetting, a great accompaniment for sandwiches, and it’s also a fantastic dip for chips, crisps, and crackers too. 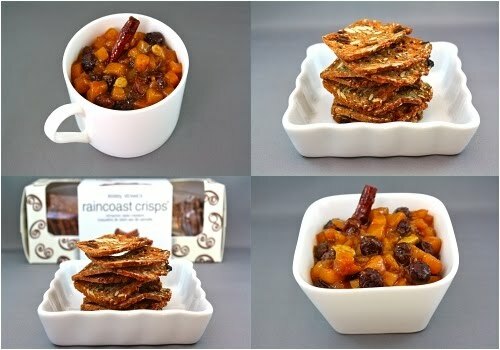 Speaking of crackers, I recently had an opportunity to try out Lesley Stowe’s Raincoast Crisps’ newest creation, the Cinnamon Raisin crackers. Fabulous all natural crackers, handmade with care in small batches. I found this new cracker tasted great and was even better with the mango chutney. So, do try out my mango chutney recipe as your next side dish or snack dip. Enjoy! Place all the ingredients in a saucepan, and bring it to a boil. Stir well and reduce the heat to medium. Continue to simmer the mango mixture for about 20 to 25 minutes or until the sauce has thicken. Cool completely. I made some mango chutney a while back. It was a bit different than yours and we loved it with chicken. This looks great with those crunchy crackers. That's a lovely mango chutney. Thanks for the recipe. cool that looks superb! i wanted a mango chutney recipe to go with oignon bhajis ! @Cyberman: Yuck! I have not seen any though.